Innovation: Figures in the Sand bring innovators from all ages of history to your game. With over a hundred new cards, they bring a whole new dimension to Innovation. These are used in addition to the cards from the base set. Every time you share a dogma effect or an opponent uses the achieve action, you'll get to draw a new Figure. Each Figure has a Karma effect which provides a continuous bonus or change to the rules of the game, making your other innovations more powerful. Many also have Inspire effects that enhance your Draw action. If you collect enough Figure cards, you can issue powerful Decrees that advance your civilization... or hurt your opposition. This is not a standalone game, the base set of Innovation (Third Edition) is required to play. 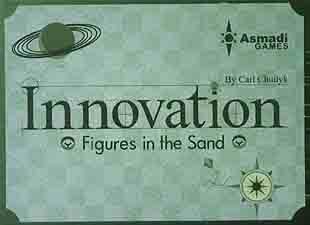 Figures in the Sand can be used with or without other Innovation expansions. Features updated cards, graphic design and artwork.